A box containing a quantity of Mint Cosmetics teeth whitening kits. I’ve contacted them direct and waiting for a response. This item is sold online by many distributors therefore is difficult to trace back. Clover Chemicals suggested that cleaning products may have originally been sent from one of their distributors so we contacted a couple. With the passage of time and due to the nature of these products, it’s difficult to trace back. Evans Vanodine use various parcel companies who may in turn sub-contract out deliveries. 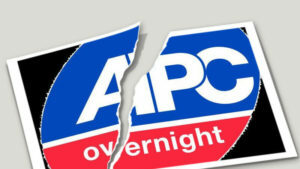 Contacted MH Plastics to see if they used APC Overnight or RDM Distribution and waiting for reply. Could just be a re-used box. I contacted Powerlite formerly Key Lighting and they are current customer of APC Overnight with Euro-Trans Despatch being their local depot. I contacted Aidapt Bathrooms who distribute direct and have never used APC Overnight or Swift Despatch. Not sure how a DPD customer’s parcels ended up in the APC Overnight depot. A box containing a Lowara submersible pump with Hereford Rewinds asset tagging. Herefords Rewinds is not a customer of APC Overnight but located on the same Thorn Business Park as local depot APC Hereford. Simply contacting them would have helped in returning the item to its true owner. A box containing a quantity of greetings cards. This box has a delivery address on it and enclosed paperwork. There is no evidence that reasonable efforts were made to trace this back to its original owner. At the very least, the parcel should have been cleansed so as not to pass on any commercially sensitive information before being sold on.